As a worldwide leader in the automotive industry, Cummins’ global workforce and move into electric power warranted a solution that would connect teams wherever work takes them. Always looking for ways to innovate and bring value to customers worldwide, Cummins adopted Office 365 to give their teams tools to collaborate and create. With productivity tools at their disposal on the go, Cummins is bringing new ideas to the market faster and more efficiently. Cummins’ recent addition of an electric power segment and related acquisitions caused the organization to evaluate its strategy for cross-functional collaboration. With 58,600 employees spread across 190 countries, Cummins was searching for a solution that would enable teamwork and innovation across the entire organization. Aware of the shift in where and how work is done in the modern workplace, Cummins needed a solution that would mobilize their workforce while enforcing security controls. For any newly created documents, it was imperative to store and classify them appropriately. Cummins’ IT and ECM teams utilized the functionality of Office 365, specifically in SharePoint and OneDrive, to develop a three-tier content creation process. 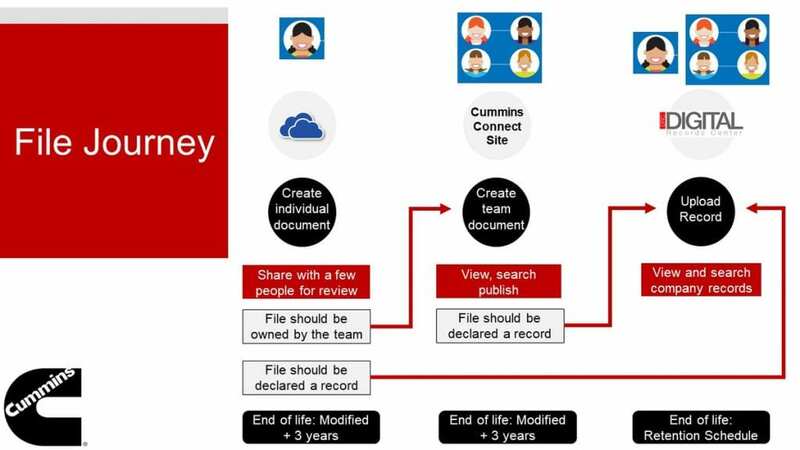 The process comprised of initial file creation in OneDrive, publication on the Cummins intranet built on SharePoint, and archival as a corporate record that would live inside the intranet. The Microsoft FastTrack team was involved in the rollout, sharing knowledge with the Cummins employees to boost immediate adoption of the Office 365 solutions. As part of this effort, Perficient helped Cummins by building a custom app to assist with the bulk upload of content from file shares via a form which provided a quick way to tag content in bulk. This ensured that all content that was uploaded to Cummins’ digital records center (DRC), was tagged according to the company’s metadata strategy. The app was built using the SharePoint App Model through a provider hosted app which integrated with Cummins’ hybrid SharePoint environments to place documents in the correct records centers based on the metadata selected by the uploading user. The Cummins global workforce has shown strong adoption of the new Office 365 solutions, with survey results showing that 80 percent of Cummins employees find Office 365 more effective for getting work done compared to the prior tools. Employees are engaging with the intranet, using it to upload 4.9 million files and create 16,000 new sites since the implementation. Collaboration and productivity have improved across departments as employees adopt new tools and processes created. Cummins is looking to continue further utilization of Office 365 after seeing great results, hoping next to implement Microsoft Teams and PowerApps. Today, we have an enterprise data management solution that adheres to our document classification and retention policies using Microsoft SharePoint Online. This is huge from a compliance perspective for Cummins."